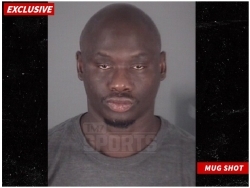 TMZ SPORTS -- Ex-boxing superstar Antonio Tarver was arrested Monday for domestic battery, TMZ Sports has learned. The 49-year-old was taken into custody in Florida around 7 PM -- he was booked and spent the night in jail. He was released around 7 PM Tuesday evening. According to his booking sheet, Tarver is 6'2" and 225 lbs. Bond was set at $1,000. The details surrounding the arrest are unclear. We're working on it. Tarver has had a history with the law -- he was arrested back in 2014 stemming from an unpaid gambling debt at the Wynn hotel and casino in Vegas. Tarver was a stud boxer back in the day -- winning multiple belts and chalking up impressive victories over stars like Roy Jones Jr. He also starred as Mason "The Line" Dixon in the 2006 "Rocky Balboa" flick.